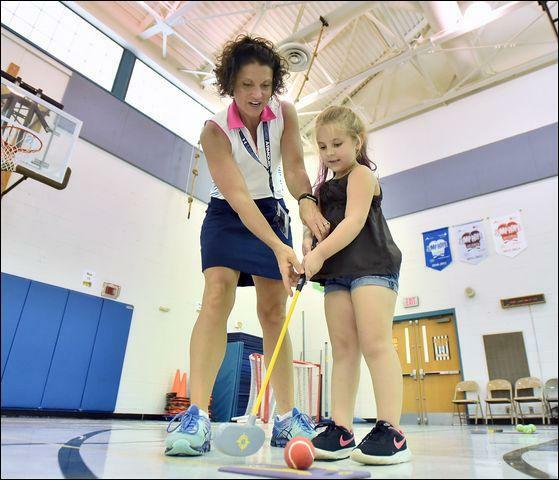 Center Township Elementary physical education teacher Tanya Wilkinson helps second grader Lyric Sleigher with her stroke during golf class. CENTER TWP — Golf is more than a game. It promotes life lessons and personal conduct. Tanya Wilkinson wanted to teach such things — so she decided to teach golf to her students at Center Township Elementary. Wilkinson is a physical education teacher for grades 1-4 at the school and a longtime golfer. “I grew up playing competitive softball,” she said. “When I was done with college, I still wanted to compete. I got into golf because that's a sport you can play your entire life. The First Tee program is a national organization that introduces young children to golf through free clinics. The program emphasizes nine core values: Honesty, integrity, sportsmanship, respect, confidence, responsibility, perseverance, courtesy and judgment. Center Township Elementary emphasizes similar values through its SOAR motto. SOAR serves as an acronym for Safe and in control, Ownership, Attiude, Respect and Responsibility. Wilkinson applied for and received a $5,000 grant from the Golden Tornado Scholastic Foundation to put her golf program in place. She bought the necessary equipment and teaches the game to her students on a four-week cycle. The students practice golf in the gymnasium. They use golf clubs with over-sized club-heads and the golf balls are the size of tennis balls. They hit the ball toward a cup positioned on the floor, with a flag atop a pole on the cup, mimicking a hole on a regular golf course. “The target is Velcro, so the ball will stick to it,” Wilkinson said. “I'm able to teach the kids how to putt and how to chip, how to get a basic swing down. Another long-range benefit to the program may be finding more potential golfers for the high school's boys and girls teams. “Some of these kids may decide the game is not for them and may never pursue golf,” Wilkinson said. “Others may find they really enjoy the sport and may continue playing as they grow up. “Some of them may wind up on our high school team or simply having learned an activity they can forever enjoy. “Regardless, all of the kids are learning valuable lessons out of learning golf. They are all being introduced to the sport. That makes it worth it for me,” Wilkinson added.